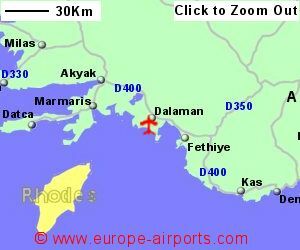 Find and compare the best prices from a range of well known car rental companies at Dalaman Airport. This is a free to use facility, enabeling you to book direct with the company quoting the price. 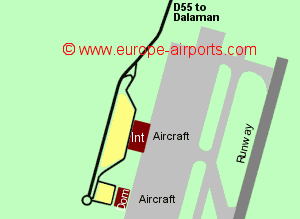 Dalaman airport has two terminals located approximately 200m apart. The modern International Terminal building was opened in 2006, and there is a separate domestic terminal. Shuttle buses run between the airport and various locations (Fethiye costing 20 Lira for the 70 minute journey and Marmaris costing 25 Lira for the 90 minute journey). A taxi from the airport to Fethiye is likely to cost 170 Lira (approximately 42 Pounds), for the 70 Km journey. Facilities include 16 cafes/restaurants, shops, a bank, 2 currency exchange facilities, a Premium/business lounge, and WiFi Internet access. 4.3 million passengers passed through Dalaman airport in 2015, a 2% increase from the previous year, and the busiest year yet.